There are 2 ferry routes operating between Baja California Sur and Mexico offering you combined total of 9 sailings per week. Baja Ferries operates 2 routes, La Paz to Topolobampo runs 6 times per week & La Paz to Mazatlan about 3 times weekly. As the frequency and duration of crossings on some routes varies we would advise that you do a live search for crossings from Baja California Sur to Mexico to get the most up to date information. Baja California Sur is the youngest and second smallest state by population in Mexico, situated in the northwest. Making up the southern half of the Baja California Peninsula, it boasts of one of Latin America’s largest single protected areas, the El Vizcaino Biosphere Reserve, which includes whale calving sites and spectacular pre-Hispanic rock art pieces. 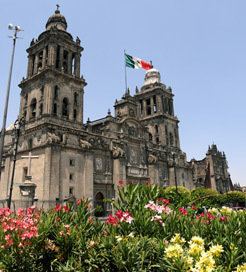 The capital, La Paz is the commercial and political hub, characterised by a stunning collection of beaches and vibrant town squares lined with coconut palms. 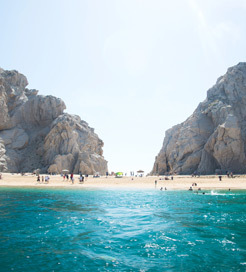 Other notable sights include the beautiful rock formation of Land’s End and the Espiritu Santo, a network of small coves with crystalline waters offering excellent snorkelling and kayaking opportunities. From La Paz, there are domestic ferry routes available to a couple of destinations across the Gulf of California to the Mexican mainland. Daily sailings are provided to Topolobampo, whereas slightly less frequent crossings are available to Mazatlan.